I did a little shopping last weekend at First Monday in Canton, Texas and came away with a few treasures. 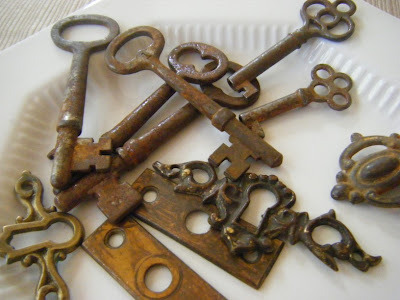 My favorites were these skeleton keys and miscellaneous pieces of hardware. I can't wait to get them cleaned up and sealed so I can use them in some jewelry projects I have in mind. I was also happy to find these vintage calling cards. I don't really have any plans for them right now, I was just just struck by their sweetness and thought I'd add them to my file of fabulous stationary. Let's see...what else? Some pretty gemstones and pearls...vintage jewelry odds and ends...lots to keep me busy...and more large house keys to be altered. I guess I'd better get to work! I'll post some photos when I get some new pieces together. We're expecting a rainy Saturday tomorrow. 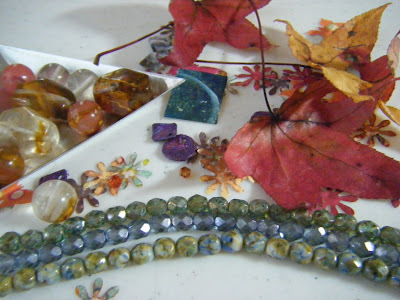 I need to photograph some jewelry, so I'm going to have to try to get that done before midday, when the clouds are expected to roll in. I've been doing most of my photography outdoors and that takes a bit of planning. One last thing...I thought I'd share a color pallette I'm compiling. It started with a pretty red leaf as the main color. I laid it on my desk and have since added bits and pieces of gold, light teals and greens, and various blues. The bit of purple I have added here might be a bit too much...what do you think? I hope you have some fun plans for the weekend ahead. Enjoy! You & that good eye... eager to see what you do with the keys, what great finds. The color palette? Love the teals & blues... take them away, your inspiration would still be lovely... but their presence excites the other colors, allows them to sparkle. Like adding water, or the sky, to the landscape. You've changed your site! Love the new pic, but I miss the old one. Might I suggest a split screen? 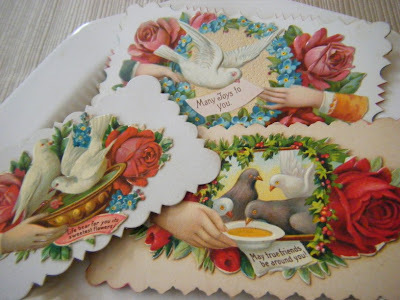 I really like the vintage cards, too - very pretty. And for the record, I think the purple makes the photo pop!